The terms of business set out below govern the legal relationship between Skyline GmbH (limited company), in A-1061 Vienna, PO box 161, and the costumer who orders goods from our online shop. Aforementioned transactions are governed exclusively by these terms of business, yet special or additional terms and conditions may be agreed upon with the customer and form part of the contract if applicable. Terms of business as used by the customer which are differing from the aforementioned are not applicable. 2.1 The costumer has to be 18 years of age or older to order from our online shop. All offers made by Skyline GmbH (limited company) are subject to these terms of business. 2.2 Orders are binding. The business contract is formed by shipment of the ordered goods, or by written confirmation from Skyline GmbH (limited company) within two weeks of the order. 2.3 Definite prices are derived from the list prices effective on the day of the order. All quoted prices include value added tax. Skyline GmbH (limited company) reserves the right to change prices without prior notice. In Austria: Raiffeisenbank, bank code number 32000, account number 7817174 A confirmation of the order will be sent to the customers e-mail adress as soon as his data has been checked. The risk of damages to, or a deterioration of goods is passed to the costumer as soon as the goods are dispatched. This also applies if Skyline GmbH (limited company) is bearing the costs of transportation. 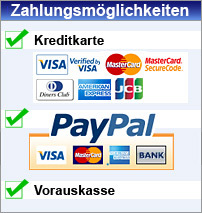 Legal requirements of the Austrian Law for Consumer Protection apply. When delivery of goods is refused by the customer, Skyline GmbH (limited company) is entitled to charge the costumer for all ensuing costs. Depending on the kind of delivery, such costs may include transportation costs to and from the customer, COD payments, and handling charges. Delivered goods remain the property of Skyline GmbH (limited company) until they are completely paid for by the customer. 7.1 For a period of six months - starting with the day the goods are dispatched - Skyline GmbH (limited company) gives a warranty covering any such product faults as are provided for by applicable law. Warranty claims are initially restricted to improvement through the exchange of goods. Should such improvement fail, the costumer may choose between a price reduction or withdrawal from the contract. Warranty claims do not extend to negligible faults which are costumary in the trade or technically unavoidable, or such faults as are caused by the improper use of the goods. Faults of delivered goods have to be announced in writing immediately, or within 14 days of delivery at the latest. 7.2 Skyline GmbH (limited company) gives no warranty of merchantability and fitness of goods for a particular purpose. Claims to product liability are ruled out if they are derived from direct or indirect damage suffered by the costumer or user (in the form of loss of income, loss or damage of property, or the death or injury of any person connected in any manner with the purchase or delivery of any product), and Skyline GmbH (limited company) cannot be proven guilty of wilful action or gross negligence. In all other cases, the legal requirements for an exemption from liability - as quoted separately - apply.